The title picture and the picture above is our A++ Blood Tangerine female. This gecko was hatched on 6/17 and is now 35g at just 2 months old. This amazing gecko is an offspring from our star Blood male, Kratos, and Blood Albino female, Electra. You can see the pictures of both parents on our breeder collection page. Right away you see how this girl takes after the father’s looks, with bold spots on the head, and stunning blood orange coloration on the back and tail. Her sibling is a Blood Albino. Main differences are Albinos don’t have black spotting, and Blood Albino eyes are fiery red. Take a look at the red surrounding the iris of the eyes, that is an unique trait found only with high quality Blood Albinos. 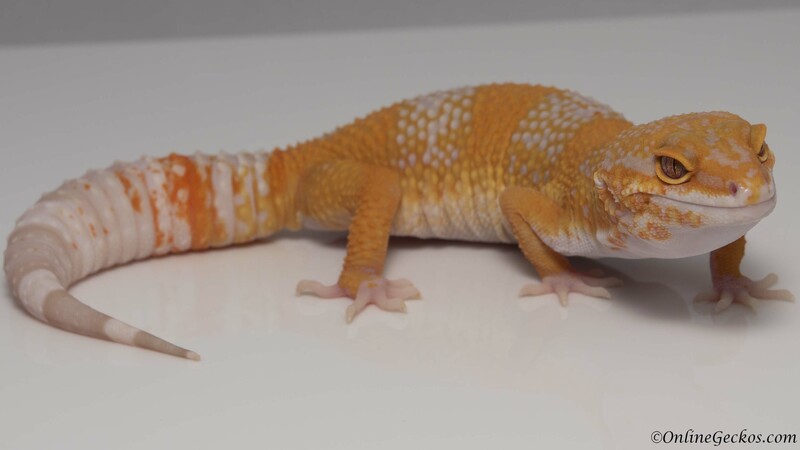 Both morphs are beautiful in their own ways; Blood Tangerine offers contrasting looks and deeper red saturation, Blood Albinos offer high color pop with deep orange and fiery red eyes. We have always enjoyed Mack Snow Eclipses due to how cute their white nose and black eyes look. This Mack Snow Eclipse female has pretty reverse stripe patterns going down her back, with lavender patches extending down her tail. She is just absolutely adorable. The best part is she is an extremely docile gecko. This makes her an ideal pet for first time gecko hobbyists. 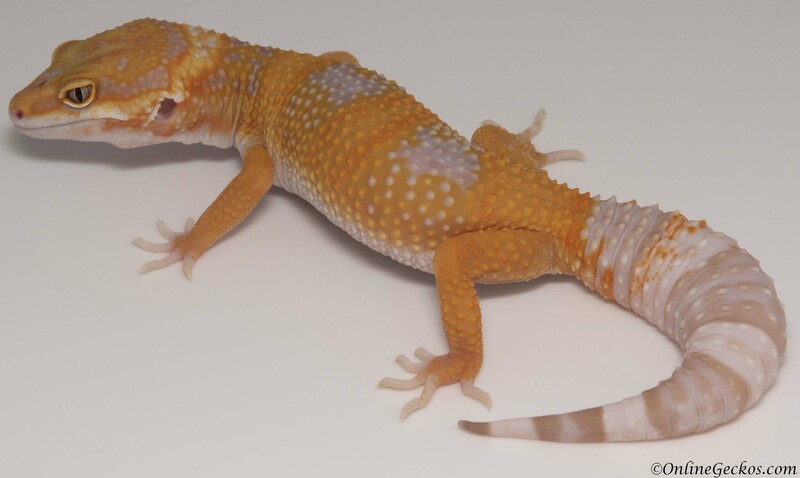 This Tangerine Tremper Albino female has beautiful sharp blend of yellow and orange patterns on her back. She is a result of our experimental project combining our best looking Giant Hot Moose male with a high quality TUG Tremper Sunglow female. We are loving the results so far. She’s a very docile leopard gecko, she’ll make a great pet for first time gecko hobbyists. 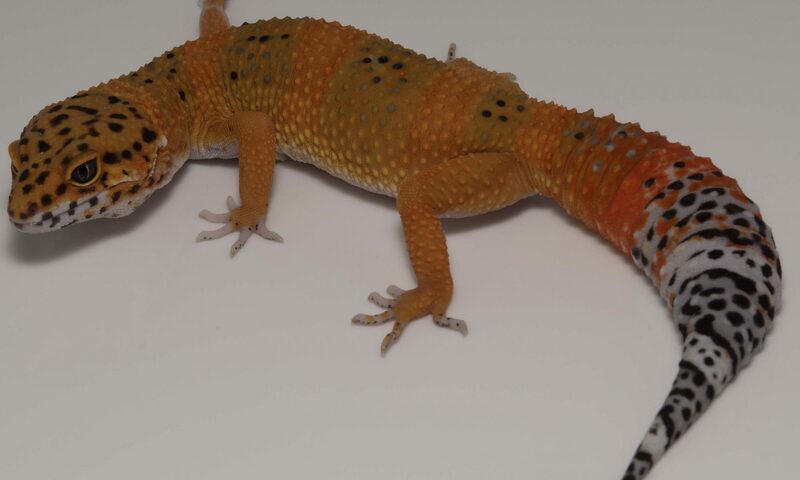 If you are a breeder, her bright colors will enhance your tremper albino projects. To see all the 2018 leopard geckos for sale, please visit our available leopard geckos for sale page. We will be adding batches of new 2018 hatchlings/juveniles every few days for the next several weeks. It takes a lot of time to photo shoot the geckos, process and mark them properly, and put all the information on our for sale page. Since we are small scale and we do have fulltime day jobs, posting new geckos for sale will take a bit. We thank you for your patience. 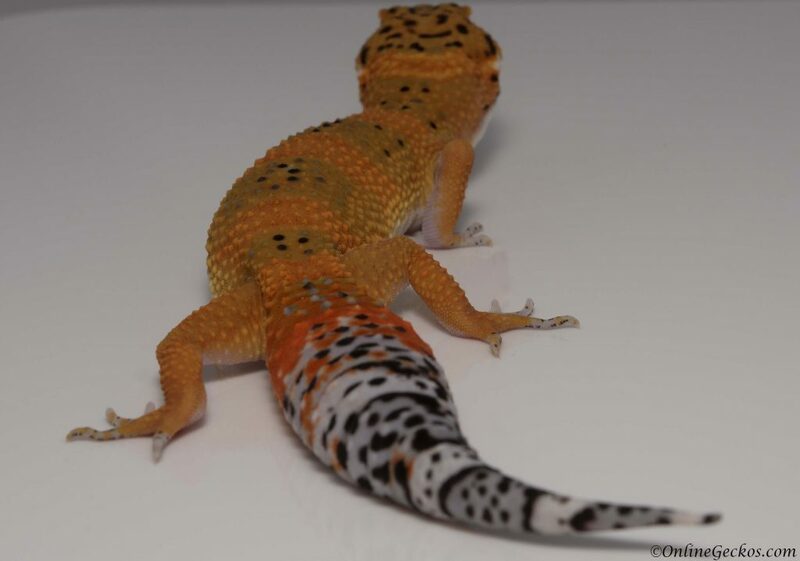 Unsure whether to get a male or female leopard gecko as pets? Read our blog article that explains some differences in male vs female gecko pets. 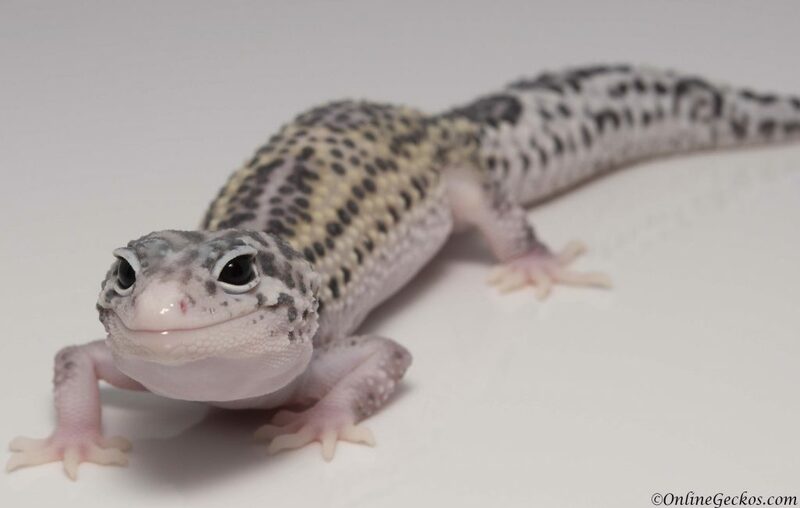 Want to start breeding leopard geckos? Read our article on small scale leopard gecko breeding 101 for some tips and advice. New to the hobby? Be fully prepared and read our gecko tank setup guide. Unsure how to setup the under tank heating pad? 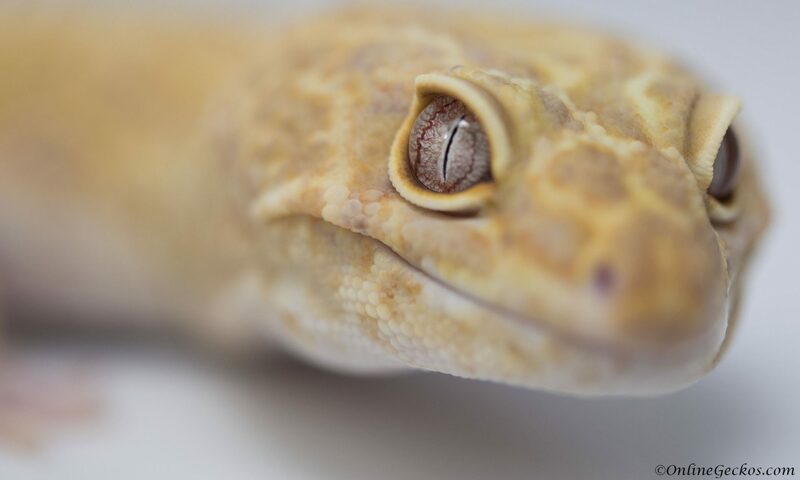 Check out this article for proper belly heating for your geckos. Need to know how to supplement properly? This vitamin supplement guide has all the information you need.